Fourteen children were physically abused and medically neglected in The Body, a cultlike organization controlled by their grandfather, Roland Robidoux, and his son Jacques Robidoux. When they were rescued, the victims included: 4 children of Jacques and Karen Robidoux; 5 children (ages 3 to 10) of Dennis and Michelle (Robidoux) Mingo; 4 daughters of David and Rebecca (Robidoux) Corneau; and 1 infant daughter of Mark and Trinette (Robidoux) Daneau. Three additional children (Jacques’s son Samuel and two of the Corneaus’ children) died before they could be removed from their parents’ custody. All the children were homeschooled. 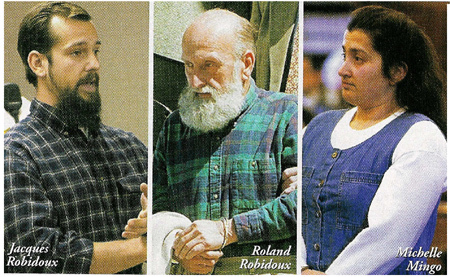 Roland encouraged sect members “to beat their children with paddles to ‘break their spirit’ and encouraged spanking babies who were just a few months old.” Sect members opposed traditional medicine (including eyeglasses), practiced unassisted homebirths, and never took their children to a doctor. The Corneaus’ two dead children—Jeremiah, born in spring 1999, and an unnamed child born in late 2001—were stillborn due to complications in unassisted homebirths. Samuel Robidoux was 11 months old when he was deliberately starved to death after a religious vision by Michelle Mingo. The murder came to light in November 1999 when Dennis Mingo fled the sect with his children and reported it to the police. The rest of the children were subsequently removed by social services. Jacques Robidoux was convicted of murder and sentenced to life in prison. Karen Robidoux was convicted of assault and sentenced to time served. Michelle Mingo pleaded guilty to accessory to murder and was sentenced to time served. Roland Robidoux was never charged and died of natural causes in 2006.